Enriching the lives of the people by reducing taxes cultivates national strength. The predetermined tax system must be maintained even if the state is involved in many affairs and it struggles from a lack of funding sources. The people below must not suffer even if the people above incur losses. Observe history well. When what is just and right is not clear, and there are difficulties due to a lack of funding sources, it is inevitable that government officials with a low level of cunning and crafty thought will be employed. Those who temporize with stopgap measures will be recognized as admirable officials with an excellent understanding of fiscal matters. These officials will use any means, by hook or by crook, to squeeze taxes out of the people. People will then become unable to withstand hardships, and to avoid them they will naturally engage in falsehoods and fabrications. The people above and the people below will cheat each other, and government officials and the people will turn against each other. In the end, won’t that country rupture and fall apart? – Matsushita Konosuke, the founder of Panasonic and the Matsushita Institute of Government and Management. Japan’s new prime minister, Noda Yoshihiko, was a member of the first class and is the first prime minister to have been graduated from that institution. A core element of his fiscal policy is to increase taxes. ONE of the most colorful words in the Japanese language is funpan, written 噴飯. Used as a noun, it means absurd or preposterous. Used as a verb, it means to burst into laughter. The best part of the word is the combination of kanji; together they literally mean “spew rice” (or food). Funpan is the word that usually comes to mind whenever I stumble across political analysis from the boys and girls playing newspaper at the Japan Times. JT staff writers Jun Hongo and Hiroko Nakata were in analytical mode today regarding the election of Noda Yoshihiko as DPJ president and imminent prime minister. Their piece should come with the Surgeon-General’s recommendation to read it at least 30 minutes after a meal. Failure to heed that advice could result in so much funpan the knowledgeable reader would be compelled to spend the better part of his day cleaning spewed rice off his computer screen, keyboard, and the wall behind them. No, they didn’t mention the “political experts” by name, their qualifications as political experts, or why the experts welcomed Mr. Noda. That’s Japan Times policy. All the computers used at news outlets to write the English-language reports on new prime ministers and finance-related Cabinet ministers from the Democratic Party, both here and overseas, have specially programmed hotkeys. For example, type #%$ and the phrase “fiscal hawk” appears. Since “fiscal hawk” used in this context always means “supporter of a tax increase to reduce the budget deficit”, the editor (assuming the paper has any) missed the Hongo/Nakata pleonasm. When a Japanese politician is approvingly called a fiscal hawk it never — never — means that the politician cited is serious about cutting government spending. On the currency market, a Noda administration is likely to have more success in stemming the yen’s sharp appreciation against the dollar, as it will be easier for the Bank of Japan to cooperate with the person who served as finance minister than other candidates, many of whom looked too aggressive in putting pressure on the BOJ in dealing with deflation and the yen’s rise, Dai-ichi’s Kumano said. Even the Japan Times’s identified experts require a funpan alert. Kan Naoto served as finance minister just before he was named prime minister, and his administration didn’t have any success stemming the yen’s sharp appreciation against the dollar, despite the presence of the Dynamic Fiscal Hawk Duo. The junior journos assured us last year that Mr. Kan was a fiscal hawk too. You could look it up, starting with the search engine on the left sidebar. There is almost nothing the BOJ can do to stop the yen’s appreciation against the dollar when the Americans are beavering away at the devaluation of their own currency under prevailing economic conditions. The American journo/politico class dares not speak the name of those conditions, but other people do: Depression. Tax data released earlier this month showed that American incomes in real terms fell 15.2% from 2007 to 2009, and that the number of taxpayers who reported any income from a job fell about 4.2 million during that time. Some people suspect the real unemployment rate is closer to a Rooseveltian 15% than the official 9%+. The official statistics also claim there’s been seven straight quarters of GDP growth. Why, sure there has, Mary Sunshine! But back to Japan. Fukashi Horie, professor emeritus of politics at Tokyo’s Keio University, was pessimistic. “If Noda is able to seek fiscal balance while also pursuing the political pledges in the DPJ manifesto, then he will make great achievements,” Horie said. They don’t make professors emeriti like they used to. The DPJ manifesto contained promises for sharp spending increases for the child allowance and farm household subsidies, as well as the loss of income by eliminating expressway tolls. Noda the Fiscal Hawk voted for all of that. The DPJ manifesto also promised no tax increases for four years. Noda the Fiscal Hawk was down with that, too. He was the shadow finance minister, after all. Finally, the manifesto promised there would be cuts in wasteful government spending to offset the new expenditures. Well, it’s not so easy for a government to keep all of its promises. If he can “seek” fiscal balance while pursuing the political pledges of the manifesto, he won’t just “make great achievements”. He’ll be walking on water. It is to funpan. Mr. Noda was known in the media — and even in the Democratic Party itself — as the Finance Ministry candidate. Noda, 54, is replacing Prime Minister Naoto Kan, who leaves a government ¥900 trillion in debt. Passing the fiscal hawk baton to a younger generation. Fiscal reform efforts took a back seat during Kan’s tenure due to the March 11 disasters. Dealing with those disasters also took a back seat during Kan’s tenure. Everything took a back seat during Kan’s tenure to any activity designed to extend Kan’s tenure. The native of Chiba Prefecture was the sole candidate among those running in the DPJ race considered as being oriented toward fiscal reform measures. “Fiscal reform” is another one of those phrases people use in Japan when they dare not speak the name of tax increase in the context of bringing down the budget deficit. The Japanese response to the slashing expenditures part and the temporary part was funpan. The Finance Ministry wants the tax hike to pay for Tohoku’s restoration. The New Fiscal Hawk has never offered a convincing explanation why government funds on hand or (very) long-term bonds can’t be used to pay for Tohoku’s restoration. He also advocates easing the burden on the private sector, saying the corporate tax should be slashed by 5 percentage points in order to support business competitiveness. Now you see why Keidanren likes him. He was also a central figure in writing up a $100 billion program designed to extend loans to domestic firms to spur overseas investment. Hey, why not? The American stimulus programs have “made a great achievement”, haven’t they? Hold on…it’s going to take a few seconds to fit $100 billion government loan programs to the private sector into the Fiscal Hawkery concept…OK. Overall, Noda is known for his expertise in fiscal and economic policies, having served as senior vice finance minister from September 2009 in Yukio Hatoyama’s Cabinet and then being promoted to finance minister when Kan left that post to become prime minister in June 2010. Mr. Noda applied that expertise to his assignment as vice finance minister to secure the funding to realize the manifesto pledges. His expertise was such that Mr. Hatoyama produced the highest budget with the highest budget deficit and highest deficit bond float in Japanese history (until the following year’s budget, which was produced by Kan The Fiscal Hawk Naoto). Saying he isn’t a person who acts without thinking isn’t what most Japanese normally consider to be praise for politicians. Here’s the translation: He’s not Kan Naoto. The LDP long ago signaled they’d be willing to work with just about anybody not named Kan Naoto. The first glimpse of how Noda will handle tough economic and fiscal issues will be demonstrated once he reveals his Cabinet lineup. “The key will be for him to appoint a finance minister who shares his beliefs and will not back down against the bureaucrats, in order to materialize DPJ’s policies,” Keio University’s Horie said. You know, I can’t remember if I’ve ever read a four-dimensional non sequitur before. I think this might be the first one. But enough of this — There’s a quicker way to get a read on Mr. Noda than by reading the JT analysis, and it too involves interesting Japanese vocabulary. Recall that the fiscal hawk/financial and economic expert Noda Yoshihiko was vice finance minister during the Hatoyama administration. That government raised taxes on cigarettes by 33% a pack. The DPJ also discussed increasing the liquor tax earlier this year to help fund Tohoku reconstruction. Oyaji is how Japanese men sometimes refer to their fathers in the way that Americans use the expression, “the old man”. It can also be used generically to refer to men middle-aged or older. The suffix “-gari” means “hunting”, in the sense of scalp-hunting or head-hunting. 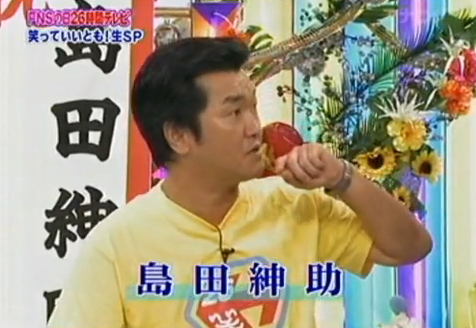 Here’s the punchline: Mr. Noda is a man known to hugely enjoy cigarettes and booze. Mr. Noda was a member of the first class of students accepted in the Matsushita Institute founded by electronics magnate Matsushita Konosuke. Matsushita’s expressed ideal was the “taxless state”, and he founded the institute to foster leaders with compatible ideals. He also said that one should not hesitate to die for one’s ideals and resolutions. Were not Japanese usually cremated, it would be appropriate to say that Matsushita is rolling over in his grave tonight. 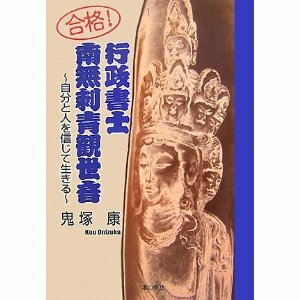 The discussion in the style of “modern thought” that has emerged after the nuclear power plant accident is of great interest because it reveals the degeneration of the arena for critical debate in Japan. There’s the agitation of Karatani Kojin, who wants to exterminate capitalism and nuclear power simultaneously; Uchida Tatsuru, who calls for the immediate suspension of all nuclear power generation and the decommissioning of the reactors; Nakazawa Shin’ichi, who wants to end both nuclear and thermal power generation and live by photosynthesis, and Osawa Masachi, who characterizes the issue of nuclear power as a choice between “our children or our air conditioners”. They’re all very amusing as comic monologues. I read a new book on this subject by Yamamoto Yoshitaka, the author of The Cultural Revolution of the 16th Century. I was interested in how he viewed nuclear power from the perspective of technography. Unfortunately, however, I put it on my list of Books That Must Not Be Read. The measured tone of an academic treatise is absent. It denounces the “self-justifications of the Nuclear Power Village” (the term some apply to the lobby in Japan consisting of the industries that use nuclear power, power companies, the companies that build the plants, the governmental oversight agencies, university researchers supporting nuclear power, the mass media, and trade journals). He also hurls invective at the explanations of the power companies, asking if they were of sound mind when they wrote them. It puts one in mind of the Zenkyoto (The All-Campus Joint Struggle) student movement of the 1960s. FINANCE Minister Noda Yoshihiko won the election held on the 29th for the presidency of the Democratic Party of Japan on the second ballot. That means he will shortly become the next prime minister. If I become prime minister, the Cabinet support ratings will not rise right away. Therefore, I will not dissolve the Diet (and hold an election). Basically, (the term of the lower house) is for four years…but any number of things could happen before that, so a dissolution is possible. Off to a good start, isn’t he? The Democratic Party presidential election doesn’t need policy. It doesn’t need a policy debate, either. What it needs is proper, commonsense behavior as an adult organization. That is the only thing the Democratic Party of Japan needs right now. GOLDFISH swallowing was a fad that surfaced in the 1920s and reemerged in the 1930s in the US, popularized by that omnipresent and amorphous pool of college boys who have a hyperactive imagination, a disinclination for schoolwork, and are always game for doing something new and goofy. The Japanese have enjoyed pastimes using live goldfish since at least the 19th century, but here they scoop instead of swallow them. The rules are simple: Grab the most in a certain amount of time and you win. 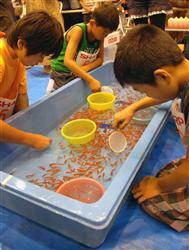 In fact, Yamatokoriyama, Nara, has held a National Goldfish Scooping Championship every year for the past 17 years. No one will be surprised to learn that the city is one the largest goldfish production regions in the country, or that they think the championship is a marvelous way to promote the industry. More than a few people will be surprised, however, to discover that there were 1,801 competitors at this year’s event last weekend — and that new event records were set in both the Adults and Kids divisions. The new champion in the adult division is a 19-year-old bucko — the perfect age! — from Kashihara in the same prefecture. He scarfed up 87 fish in three minutes. Interviewed by the media after his victory, he said, “I was lucky. I’ll shoot for a hundred next time.” He’s got the professional athlete’s postgame attitude down pat, doesn’t he? The winner in the Kids division was an eight-year-old boy from Osaka who managed to scoop 73. Now this is a boy who’s got the right stuff. He told reporters, “I’m happy, because this is the first time in my life I’ve become number one in Japan at anything.” It sounds as if he thinks becoming number one in Japan at several other things later on in life is a foregone conclusion. This a serious competition with official rules, by the way. You don’t just bring a dipper, buy a ticket, and go fish. The contestants face off in 26 separate pools, which are filled with about 1,000 fish each. In addition to a three-minute time limit, there’s a rule that contestants have to use the official goldfish scooper, which is called a poi. It is made with a round wood frame and washi, or traditional Japanese paper, to cover the business end. Scooping circuit veterans advise beginners to start from the fish head and avoid the tail, whose flopping could tear the paper. In fact, the Yamatokoriyama website has an English-language page with helpful hints on goldfish scooping, which I’d link to, but the WordPress software isn’t accepting hotlinks at the moment for some reason. It’s a tradition to have the participants in these competitions take all or some of the fish they scoop home with them. That might present a problem for the winners of the event. Just what do you do after you’ve become responsible for 87 new goldfish all of a sudden? PETA had no comment on the terror and pain of tiny goldfish as they are eaten alive by birds or animals in outdoor pools, or fed to the predatory species some aquarium hobbyists keep, or even roughly jerked out of their home environment by the hundreds as amusement in Japan. THE following is an excerpt from a roundtable discussion with members from different government ministries that appeared in the 5 August issue of the weekly Shukan Post. If you’ve ever thought I’ve been exaggerating about how socio-political sausage is made in Japan, this excerpt should demonstrate that, if anything, I’ve been understating the issue. The participants were identified only by a letter of the alphabet. METI is the Ministry of Economy, Trade, and Industry. MOF is the Ministry of Finance. A is an older man, and D is a younger man. Q: Was the confusion over the issue of eliminating nuclear power due to the politicians and the national newspapers getting caught up in the tug-of-war between METI and the Finance Ministry over the expenses for cleaning up the nuclear reactor accident? METI A: Senior ministry officials were enraged at the change in the Asahi Shimbun’s attitude, and they began to pay closer attention to the Finance Ministry’s movements. The strength of electric power industry advertising (revenue) had caused them to promote nuclear power, so the change in the tone of Asahi’s argument itself could have been nothing more than the use of the nuclear accident as an opportunity to revert to a leftist opposition to nuclear energy. The argument that an increase in the amount of green energy could be a substitute for nuclear energy is of such a low level as to be risible. MOF B: Wasn’t it METI who leveraged the media’s paucity of scientific knowledge, though? After their editorial calling for a nuclear power-free society appeared, even the Asahi reported that the suspension of operations at the Genkai-cho plant would cause difficulties for auto production. Just one part of the media made a big issue of eliminating nuclear energy. The poison had circulated throughout the kisha (journalists’) club. METI A: Poison, eh? The favors the power companies provided to the reporters were quite extensive, seen from outside. The trip to China that Tokyo Electric Chairman Katsumata Tsunehisa took with executives from the major newspapers on the day of the earthquake became an issue, but every power company has done the same thing for quite a while. They hire buses to take young reporters on observation tours of nuclear power plants, and then have a banquet at a nearby hot springs resort. They’re each promised a companion. But the ones who did that were the power companies. MOF B: Please stop avoiding the issue. METI prepared the information when the reporters among whom the poison had circulated wrote articles promoting the use of nuclear power. That provided the reporters with the excuse that the power companies didn’t make them write the articles. You had Mr. D. prepare the information, didn’t you? And after he put the information together, his superior probably praised him for his work and took him to a ryotei (expensive traditional Japanese restaurant). The power companies took care of those expenses, too. Q: If we trace those expenses back to the source, the money would come from the electric bills paid by the public. What do you think, Mr. D? METI A: (Silencing D with a motion of his hand): That’s a tradition among our ministry, so there’s no reason to blame Mr. D. personally. Cabinet Office E: We have a publicity budget we also spread around to newspapers and television, so we can’t behave so self-importantly either. But METI had the power companies handle the publicity expenses, so neither the bureaucracy nor the reporters receiving favors had a guilty conscience. Wasn’t that the reason no one could put a stop to it? METI A: Those are the circumstances, so I’ll humbly accept the criticism. But (looking at MOF C) the MOF generated public opinion for a reconstruction tax without spending a single yen. They kept the primary mass media outlets quiet by bombarding them with tax audits. Surely it wasn’t a coincidence that the Yomiuri accepted Tango Yasutake, the former deputy finance minister, as an outside auditor? When it comes to media operations, you’re the ones with the deadly poison. Q: Listening to this conversation, I have to believe that both METI and the MOF thought only of their own benefit while manipulating the mass media to cause confusion in the nuclear power debate — METI to preserve nuclear power, and the MOF to prevent tax funds from being used for nuclear power. MOF B: This country faces the immediate problems of rebuilding from the earthquake and cleaning up after the nuclear power disaster. The very act of putting those problems aside and giving precedence to the long-term issue of phasing out nuclear power demonstrates the impotence of politics and the media. We are presenting a solid argument based on what we should do about the funding sources for reconstruction and cleaning up the nuclear accident. It is regrettable that this is being disposed of by talking about what benefits the ministry. METI A: I agree. Our ministry is responsible for the stable supply of electric power. Someone has to sound the alarm at the shallow debate conducted due to the ignorance of the media and politicians. Q: Is that how you’re going to patch things up, at least superficially? The issues of nuclear energy and funding sources are related to the approach of the state. The most important thing should be the will of the people. METI A: But this will of the people is to be regarded with suspicion, because the people uncritically believe whatever is casually written in newspapers or broadcast on television. This is not something we should say, but if you want to proceed with any major enterprise in this country, the most important thing is to give favors to the media to get them to listen to you. That’s not just the power companies or government agencies; most private sector industries have done the same thing. Q: So when the reporters you’ve denigrated write stories that are contrary to your wishes, won’t (your) nuclear power (policy) and tax increases fail to move ahead as you would like? That’s why Kasumigaseki is losing confidence. MOF B: (After a pause) It’s true that in this government, different gears have started to slowly shift out of alignment. (The Democratic Party of Japan) is an aggregation of people whose ideas about policy are fundamentally different. Isn’t it inevitable that they’ll split up sooner or later?